Beach-Rounded Basalt: This photo shows a few pieces of beach-rounded basalt. 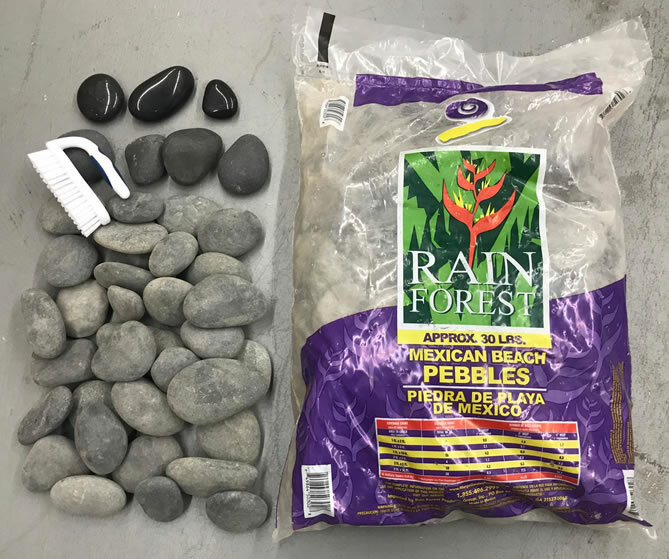 These are basalt pebbles between 1 1/2 and 3 inches in size that we purchased in a 30-pound bag at WalMart's garden center. The top three pieces were photographed right out of the bag and the bottom three pieces were photographed after we tumbled them. What a difference! 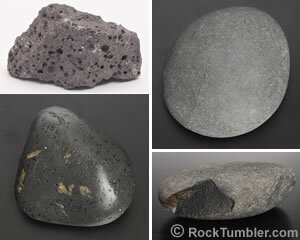 Basalt is one of Earth's most common igneous rocks. It is a black igneous rock composed mainly of tiny crystals of plagioclase and pyroxene minerals. It forms on Earth's surface when lava flows crystallize. It also can form beneath Earth's surface in sills, dikes and other shallow igneous intrusions. The bedrock of most of the ocean floor is basalt. Most basalts are made up entirely of tiny mineral crystals that are just large enough that a person can see them. If the observer looks at a freshly broken piece of basalt the crystals will reveal themselves with tiny reflections from their cleavage faces. These are the perfect basalts for tumbling. Although the crystals have cleavage it is so small that breakage during tumbling is minimized. Some basalts contain abundant pore spaces known as "vesicles". These vesicular basalts are not suitable for tumbling. The vesicles can trap grit and carry it into the polishing step. Also, some vesicular basalts have so many minute vesicles that smooth surfaces upon which a polish can be developed are minimal. 1) Crushed basalt shapes quickly and polishes to a beautiful black color. Our favorite polish for basalt is TXP aluminum oxide. Composed of plagioclase and pyroxenes, which have a Mohs hardness of about 6, it shapes faster than agate and jasper which have a hardness of about 7. 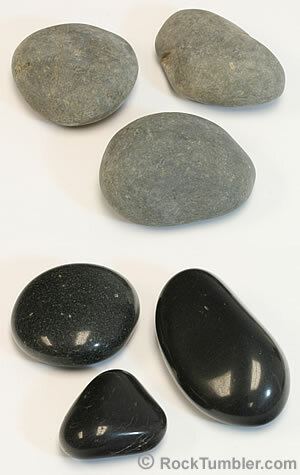 2) Basalt makes beautiful black tumbled stones. Many basalts can be polished to a very bright luster. Tiny pieces of tumbled basalt make a beautiful black ground cover in potted plants and planters. Some people use fist-size pieces of tumbled basalt as massage stones. We have seen them offered for sale in crystal shops for a few dollars per stone. 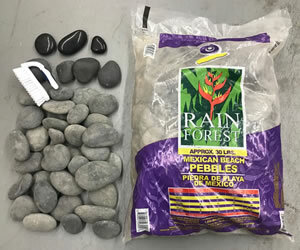 3) Stream and beach rounded pebbles and cobbles are pre-shaped for your tumbler. However, the minerals in basalt are easily weathered and you often have to grind off a thick weathering rind to prepare them for polishing. We usually run these basalts at least a week in coarse grit. 4) Basalt is usually easy to find Maybe you know where you can legally collect basalt pebbles from beach or stream materials? If not, we frequently find basalt pebbles and cobbles at lawn and garden supply centers. We have also purchased them in 30-pound or 50-pound bags in the lawn and garden center of our local Walmart and Home Depot. We once purchased a few hundred pounds from Walmart.com and they shipped it to us by FedEx in 30-pound bags. If you live in an area underlain by basalt bedrock, you might be able to purchase crushed basalt at quarries and landscaping supply stores. 5) Basalt is usually very inexpensive When we have purchased basalt at landscape supply stores the price was twenty cents per pound. After we sorted through a 30-pound bag and removed what was below tumbling grade, we had about 15-pounds left. Your yield might vary. We suggest looking through clear portions of the bag to see if the stones inside are nice. Is Your Basalt of Tumbling Grade? The term "tumbling grade" means "suitable for making nice tumbled stones in a rock tumbler". When we are preparing to tumble basalt we rinse the stones and scrub them while wet with a small scrub brush with stiff bristles. The stiff bristles help remove the dust and dirt and a bit of weathering rind from the stones. This will be your best look at the rocks before tumbling. Look for pores, broken crystals, thin cracks, chips and bruises. Rocks with these features or damage will generally not produce nice tumbled stones. Get rid of these rocks now or you will waste labor, grit, polish, electricity and at least a month of tumbling on a piece of junkite. 1) Free of pores. If it is vesicular (meaning that it contains abundant pore spaces) then it is not suitable for tumbling. 2) Unfractured. Examine each rock, looking for fractures. Any piece that is fractured might break in the tumbler and should be discarded or tumbled with caution. If it breaks in the tumbler it will scratch every other rock in the barrel. If the basalt is weathered, fractures might not be detectable until after the weathering rind has been abraded away by coarse grit. 3) Not deeply weathered. 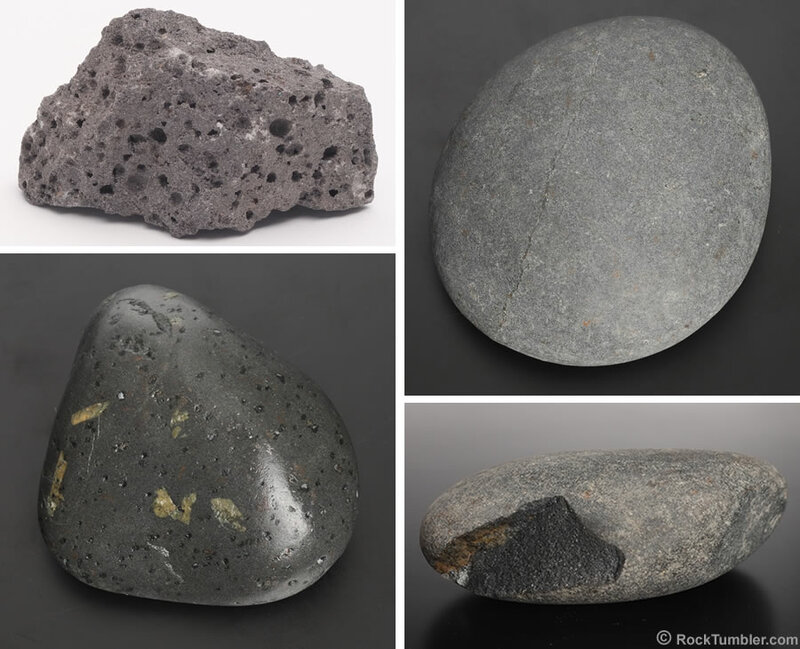 If your basalt is weathered, you can break or scratch a few pieces to determine the thickness of the weathering rind (weathered basalt is usually gray or brown, unweathered basalt is usually black). Weathered basalt will not polish, so if the weathering rind goes deep into the stone, then it might not be worth tumbling. 4) Free of vulnerable materials. Many basalts have large grains of minerals, such as olivine, or large lath-shaped crystals of plagioclase. These large crystals sometimes make beautiful features in tumbled stones but they often overcut, pop-out, or break. Some have patches of minerals that are easily abraded or that will not polish. Most basalts do not have these, but sometimes you will discover pieces of basalts that will not grind to a smooth surface or will not accept a bright polish. If you are lucky enough to collect your own basalt you should be really picky about what you bring home. Examine it in the field and reject pieces that have shapes that you don't like, fractures, gas bubbles, pitted surfaces, or anything that will reduce their ability to produce good tumbled stones. Break a few pieces in the field to observe the thickness of the weathering rind or the presence of weathered fractures within the stones. You don't want to carry home 400 pounds of stones and then discover that most of what you collected is junkite. When we tumble basalt we use the procedure below. There are many ways to tumble basalt. You might have a different method that works well for you. Time: 30-60 minutes. No Longer! Give these rocks the care that they deserve and you can produce some beautiful tumbled stones. On the other hand, if you only give them a few days in fine grit and then toss them into polish, your stones will be dull or chatter-marked because you didn't grind off the weathered surface or grind away the bruises. Think about this... If you use a rotary tumbler for the coarse grit step and a vibratory for the rest, your rocks will be polished in under two weeks. That will save you two weeks of electricity. If you use a rotary tumbler you will be working at least four weeks on this project. The rotary tumbler will use four times as much grit and four times as much polish during the medium, fine and polishing steps. Vibratory tumblers save so much money. During one or two years of use the savings in grit, polish and electricity can pay for the tumbler! Get yourself a vibratory tumbler and start saving money today.